Seriously, algae might help us grow food on Mars. No, really: Since July 2014, scientists from Fraunhofer, a German research organization, have been studying how extreme conditions in space affect algae on the International Space Station. They’ve just determined that two particular types of algae survived extreme space conditions for 16 months. Okay, to be clear, we’re not going to be eating algae. 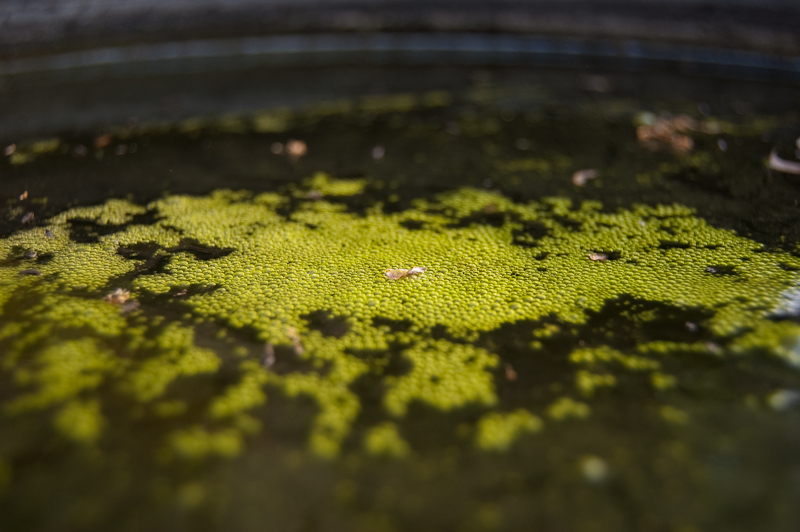 But understanding how this pond scum is able to survive the extreme heat and cold of space and the rigors induced by space radiation mean we might pick up some lessons as to what genes we can modify and augment in other plants to ensure they’re able to be grown in future space stations and settlements on other worlds like Mars. Outside the space station, where these algae grew, there are extreme temperature fluctuations, and high doses of UV and cosmic radiation. The only things shielding these algae were neutral-density filters, which reduce radiation’s effects. Researchers used sensors to measure and log temperature changes and cosmic radiation. Now, they will work on investigating how blue and green algae adapt to extreme space environments, and if and to what extent the algae’s DNA was damaged. If we ever colonize Mars, we need to figure out a way to produce food. Since some types of algae can survive in space, they’re a good candidate for food. Plus, they produce oxygen and proteins. Potentially, we could grow them in greenhouses or semitransparent tents. This research could also have some implications on a weird theory about the origin of space: panspermia, which hypothesizes organisms and early lifeforms on Earth actually came from space millions of years ago, and they eventually evolved into life as we know it. Some think maybe life reached Earth by hitching a ride on meteorites, asteroids, comets, or other space debris. Once they landed on Earth, they established a habitat and continued to evolve and diversify. These algae experiments may lead to a revival in this theory by demonstrating the possibility for more complex forms of life to survive space. Moreover, we can use these findings to help improve life here on Earth. For example, if algae can survive UV radiation, cosmetics manufacturers can use these types of algae to make creams that protect you from UV radiation. Or, algae might become the next superfood, like kale or moringa. The new results arrive at a pretty opportune time. Besides the veggie experiments NASA is running on the International Space Station, another plant experiment will launch in space this year. Scientists have planted tomato seeds on the Eu:CROPIS spacecraft, which will travel in low-Earth orbit. For six months, it will reproduce the moon’s gravitational force, and then for another six months, it will simulate Mars’s gravitational force. Although the spacecraft will have a different gravitational force, a pressure tank will replicate the Earth’s atmosphere. Plus, LED lights can provide a day and night cycle for these plants. These tomatoes will live off of synthetic urine as fertilizer. Pick your poison for your future space diet — tomatoes grown with synthetic urine, or algae.